This coffee table is a brand new design for Top Furniture. 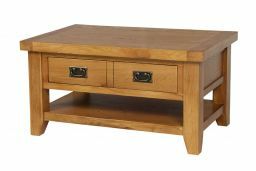 The country oak coffee table with drawer & shelf is manufactured from premium grade sustainable American Oak and is finished with an oiled wax which brings out the natural beauty of the American Oak. 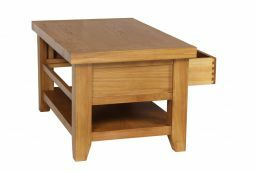 Handmade with dovetail joints on all drawers which makes these coffee tables durable. Delivered fully assembled and ready to use. 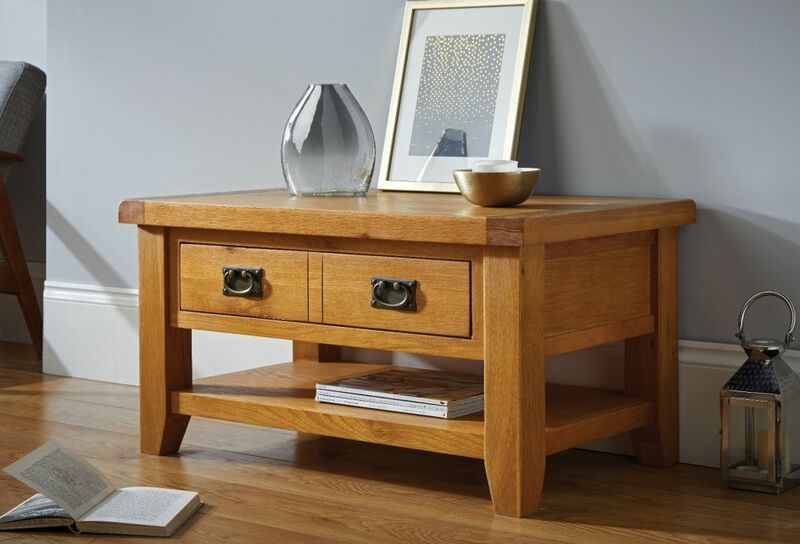 This coffee table is manufactured as part of our Country Oak Range. Excellent product at a really reasonable price (in the sale). Great quality and design - much admired. Prompt delivery with no fuss. Really pleased with quality of table. Useful addition in our sun room, well made and value for money. Gorgeous. However I did think the draws were separate. But still love it. Very helpful staff will buy again, love the Table.. Excellent service, Good value for money, Looks great. I found the company to be really helpful re any questions I needed answered and I am very pleased with the coffee table. Excellence from ordering online to delivery. A good quality coffee table at a good price. Absolutely delighted, with my beautiful, solidly made, oak coffee table & such amazing speed of delivery. Very pleased with purchase. Excellent customer service and fast delivery. Very satisfied with the service from ordering to delivery,my packaging as removed and taken away,the table is beautiful,will certainly be using Tops again and passing on to my friends and family,now saving up for more furniture,many thanks. Good weighty solid coffee table. Ordering online you never know what the real article is like but I was not disappointed I also bought the tv cabinet and two lamp tables.Excellent quality and I am very, very pleased with my purchases, and with the price I paid for them. Brilliant. I was very pleased with the coffee table. Quality was excellent and was exactly as shown on line. Ordering was easy, delivery prompt and the delivery man was polite and helpful. Table looks really good in my room. Would definitely buy from Top Furniture again and recommend the company to my friends. Bought this to match existing oak furniture,could not have been better,Excellant quality,first rate service.Thank you. Really pleased with this purchase. Lovely wood. Solid structue. Looks great. Reasonably priced and already assembled when delivered so no messing about with tools and diagrams. Delivered promptly with excellent communication about time etc. Recommended company. Love the quality. Ease of ordering, quick delivery. We are pleased with the coffee table, very good quality well made and solid.Delivered within the allocated time slot. She is happy with it, good result. I absolutely love my coffee table it looks gorgeous in my living room and matches my dining table and chairs. THE Delivery men were very helpful and i was kept uo to date with the progress of delivery .Thank you. 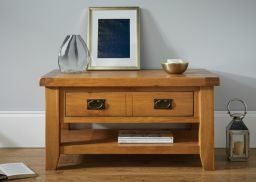 We recently purchased a Country Oak Coffee Table which was exactly as described in the write up. It's a lovely piece of furniture and we are very happy with it. I received my table on the exact time and date you told me to expect it very happy about this the delivery people were very good and i am very pleased with my coffee table. Thank you. Absolutely superb! Arrived sooner than estimated with prior contact from the driver. It is perfect and far better than imagined. Beautiful wood, beautiful finish, and it is identical on both sides so it sits elegantly in the middle of the room. If I had space I would buy another and if any other member of the family had space for one I would get it for them! Wonderful! Pleased with our purchase as to good standard of workmanship. Pleased too with contact with companies employees from the first person who phoned me up with a delivery date, to driver's mate who brought the coffee table to our flat on the tenth floor. They kept to what was promised. 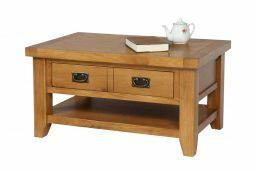 Having views many coffee tables we are thrilled with our coffee table from Top Furniture. 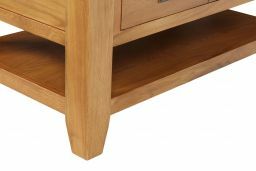 The finish is top quality - and the service we received was excellent - from placing the order right down to the delivery . A very well made table. Just what I was looking for. Will definately buy from you again. The coffee table is excellent quality and looks exactly as I expected it to. Excellent value for money. First class build quality.Single drawer opening both ways great feature.The best product we have seen with these dimensions and great value for the money. lovely coffee table we got to match the tv unit the same. Good quality and customer service will use again. Happy with the product. Requested an early delivery. Even in busy season they honoured my request and delivered in time. Shall order again in future. Really good solid piece of furniture. 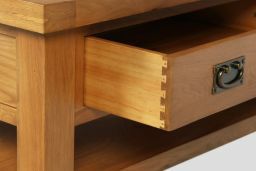 I particularly like the the drawer which opens from back and front of table, so no dark hidden corners that you can't see into. However if you are my age you will need someone to help you unpack it, the packaging was superb absolutely no risk of damage. Very good value, also like the way the corners have been rounded off on the top. The shelf holds iPad, kindle, telephone books and more. A really good buy. For the price this coffee table is very well made and finished to a good standard. 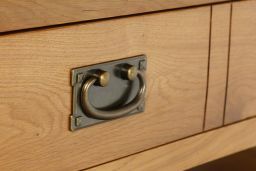 Although item reflects two drawer units it is only one when opened, which is suitable for larger items, nice surprise, very happy with purchase and will check website when considering future purchases. Very pleased with the coffee table,it is just what we wanted ,well made and the finish is good. Delivery was first class. Many thanks. Very good quality and value for money, with the drawers and shelf it meets all my needs. I would say that this item can stand any scrutiny by other manufacturers.